Weaving is a way to create fabric in which two separate sets of yarn or thread are interlaced at right angles to produce cloth or fabric. Since weaving by hand is not effective and requires immense strength, our ancestors invented the loom, a manually operated device that holds the warp threads steady while filling weft threads are woven through them (we’ll discuss a little bit about warp and weft threads a little later). The weave is the way in which the warp and weft threads interlace with each other. For thousands of years, the manually operated loom reigned supreme in the art of weaving. However, the use of the device disappeared during the Industrial Revolution in the mid-1700s to mid-1800s, the era of transition when hand-production processes gave way to vastly more efficient machines. Weaving machines, or power looms, can churn out meters upon meters of weaved fabric in a single run, allowing textile manufacturers to create products in bulk at the least amount of time at a low cost. Today, most weaved products that are sold in the market are machine-made. Traditional weaving, therefore, is a dying industry. However, there are still several places in the world in which such industry continues to be practiced. 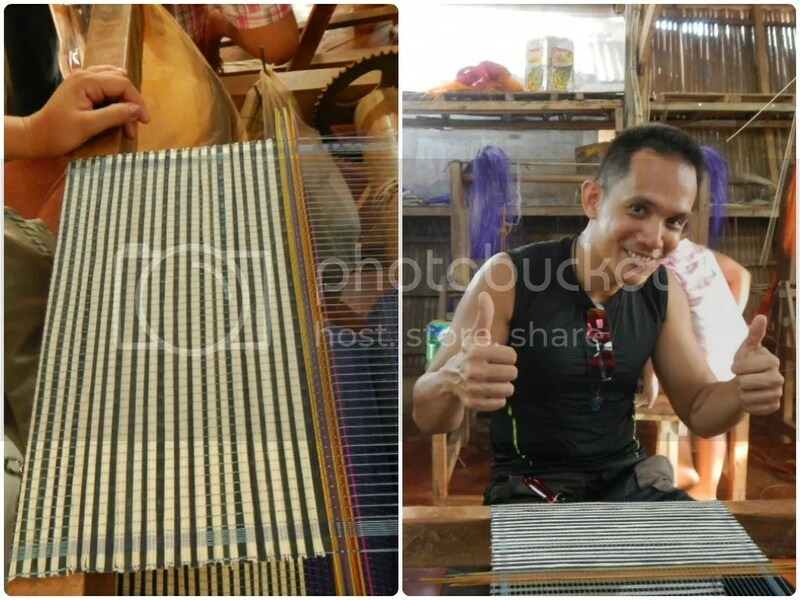 And in Puerto Princesa, Palawan, you can actually participate in a hands-on experience and demonstration in traditional weaving in Binuatan Creations. Right after we went through the entrance, we saw the production site. Except for the floor, the factory is constructed out of traditional house-making materials such as nipa and bamboo. The looms are arranged in a neat and organized setting. Entering the factory is like stepping back in time. 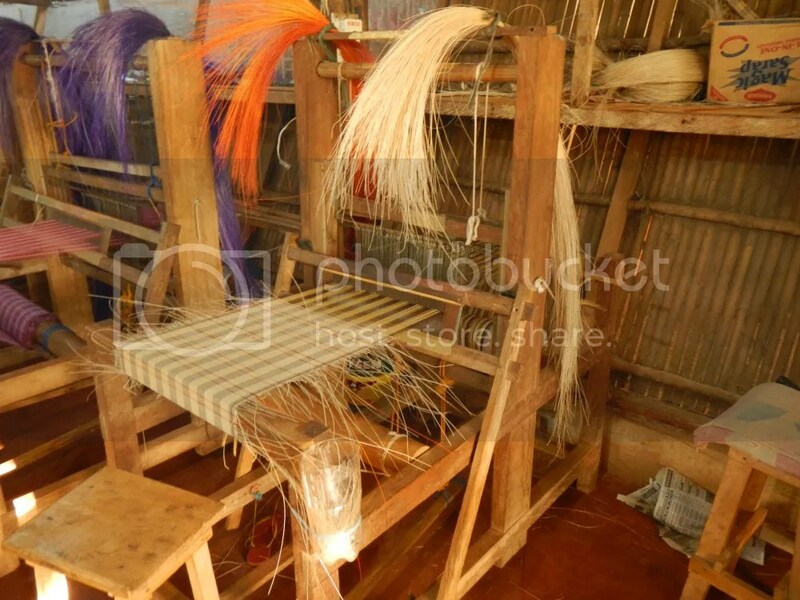 It was our first time to see a foot-treadle floor loom. It looked so sophisticated! Outside Binuatan Creation’s factory, this guy prepared the warp, the longitudinal (or lengthwise) set of yarns or threads that are held tightly on the loom. The yarn must be strong because it is constantly held under high tension. 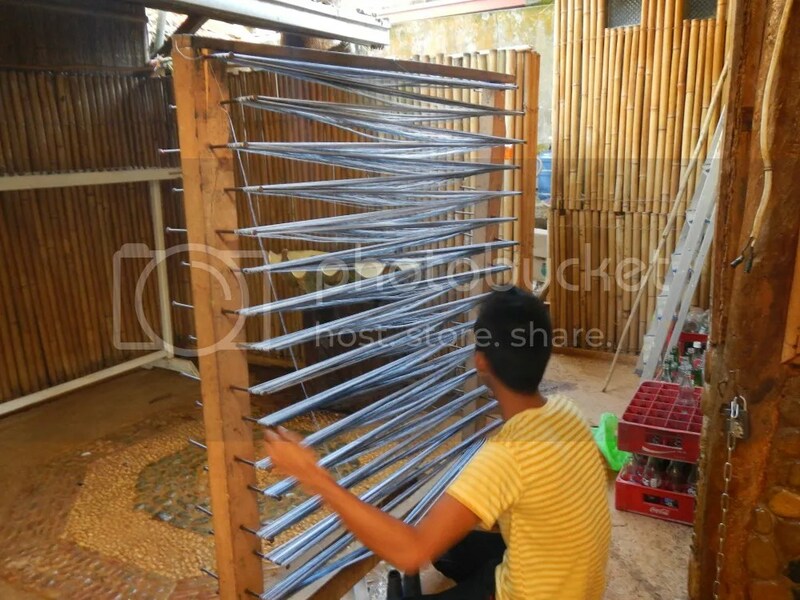 He looped the warp so fast that we actually couldn’t see the how he managed to loop the threads around the nails. And take note: that yarn must be always be stretched tight. It was like watching a street magician perform his trick. According to one of the workers there, the yarn they use is spun out of fiber from local grass or cashew tree bark. Most of the weavers here are young women since they have smaller hands. Having smaller hands is an advantage in weaving because they can easily insert the waft through the small space between the two sets of warps. 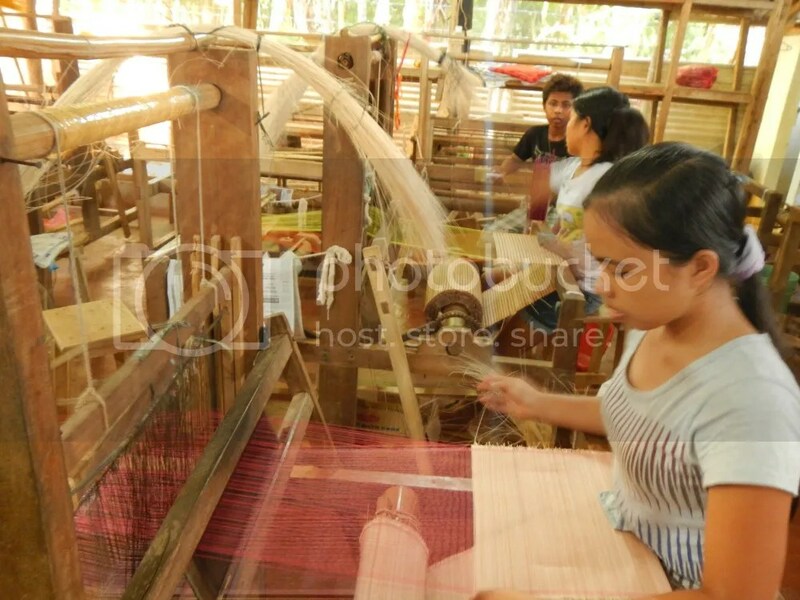 They have been doing this for years, and seeing how fast they weave and operate the loom was just amazing. Then, we tried our hand on weaving. We tell you, it’s not as easy as it looks. You need excellent eye-and-hand—and foot—coordination as you thread the waft and push the pedals. You need to concentrate because if you make a mistake, you have to pull the waft out. Lastly, you must keep in mind the design you want to create because, unless you want a single color of textile, every waft you place affects the overall design. That’s us, working on a loom. See the sweat breaking out of us? You now have an idea of how complex and difficult traditional weaving is. That’s the waft, the thread that is inserted crosswise through the warp. As you can see, the space between the warp is small; that’s why people with small hands are best suited for this kind of work. Even in the old days, women and children were employed to weave due to their small hands. In machine looms, threading is done automatically with a shuttle that passes through the space. Stepping on one of the foot treadles crosses the warp around the waft, allowing it to stay in place. The last stage of the weaving process is battening. This involves pressing the portion of the weave that has not been rolled up to the rest of the fabric. To do this, the weaver uses a comb-like part of the loom called a reed to batten, or press, the warp to the rest of the fabric. This has to be done each time a waft thread is inserted. That’s the final product that Sweetie and I made. Well, actually, we only worked on that multi-colored part. Compare our lousy work with the rest of the fell. 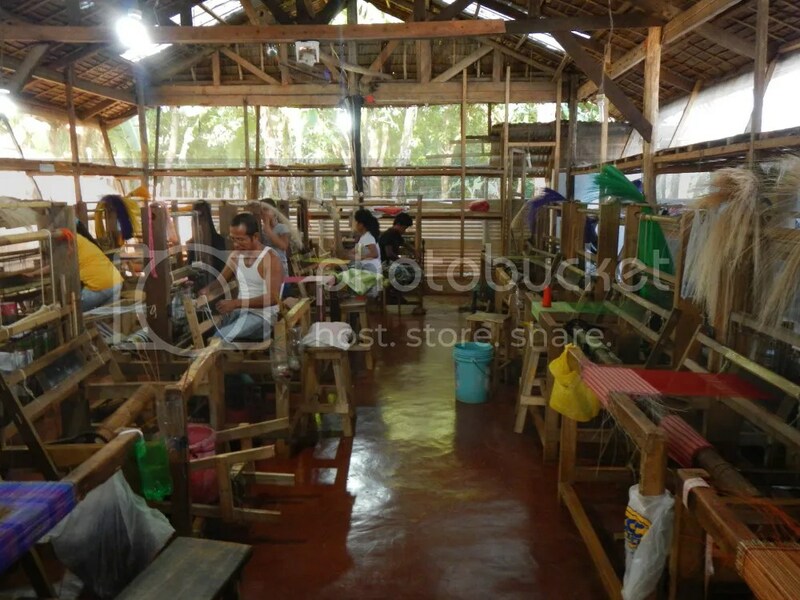 After we tried our hand at weaving and operating the loom, we headed out to Binuatan Creation’s souvenir shop. The floor, as you can see, is made up of carefully polished bamboo, which is why guests are required to take off their footwear before entering the shop. 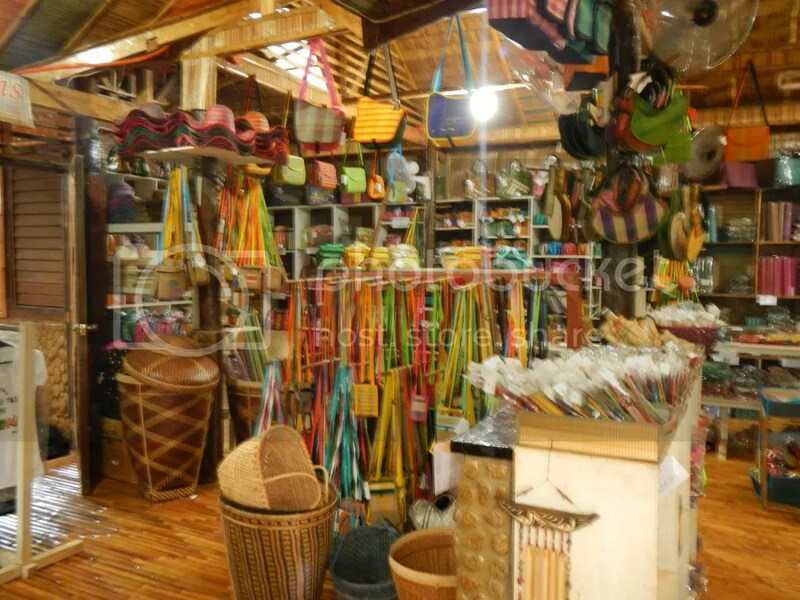 Inside, you can find lots of beautiful weaved products, sculptures, shirts, home decors, and souvenirs. Take your pick: bags, hats, trinkets, place mats, coasters, baskets, wallets, coin purses, envelopes, and other items, all of which are painstakingly handmade. Best of all, they’re affordable. Sweetie checked out some of their products. Look at those shelves full of textiles and weaved products! There are lots of treasures here. 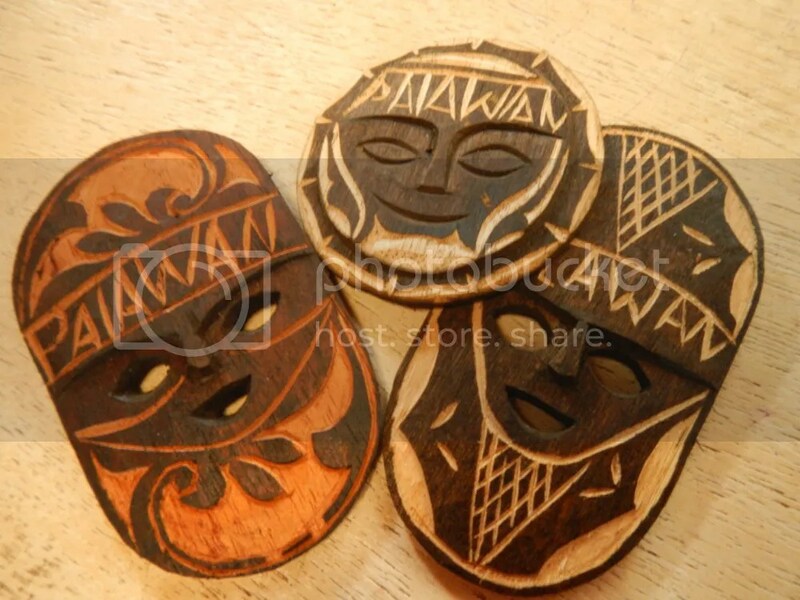 We bought these three hand-carved tribal-mask refrigerator magnets as souvenirs. 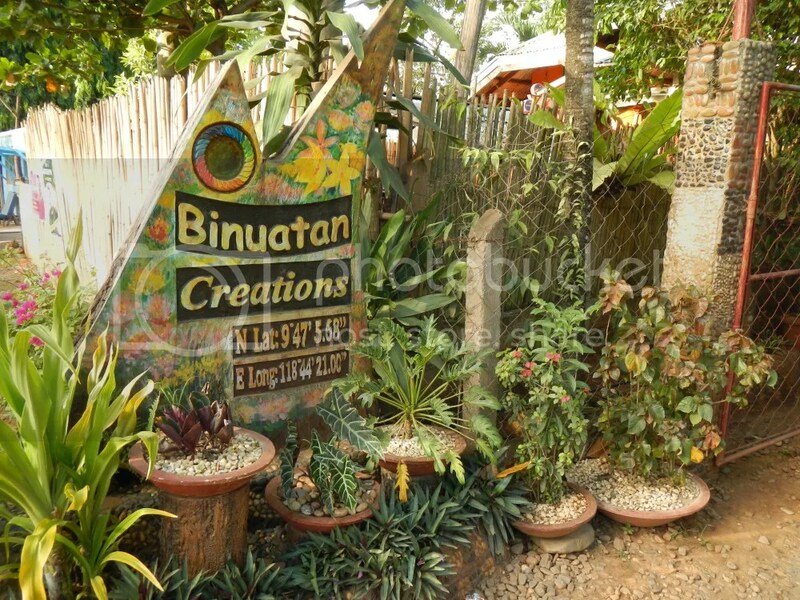 Visit Binuatan Creations now and witness the old tradition of Palawan’s arts and crafts. 2. Don’t miss out the opportunity to try the loom. It’s really fantastic, and it lets you feel the art, dedication, and passion of the weavers. 3. Take off your shoes before entering the souvenir shop. The bamboo floor is meticulously polished, and you wouldn’t want their staff’s efforts to go to waste. 4. The souvenir shop is filled up to the roof with all sorts of stuff. 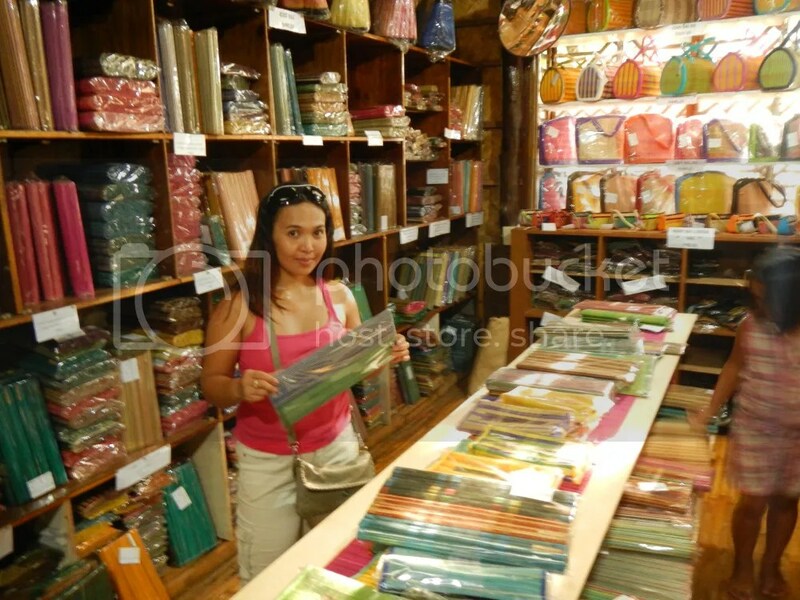 If you want to shop for souvenirs, take your time and look into every inch of the displays. You might miss out the perfect bag, basket, wallet, etc., if you hurry. 5. This is one of the places where haggling over a lower price should strike your conscience. The products are already sold at very affordable prices. Considering that the products, which are exceptional in quality, are painstakingly made by hand and the great effort being exerted to create these products, it should be easy for you to see that the workers are living on razor-thin profit margins. Simply pay the price indicated on the tag, and you’ll be helping a working mother, an out-of-school youth, or a volunteer student earn something to buy the food on his or her table. We have a spare day in PP and your fascinating report has convinced us to check out this place. Thank you! Thank you, too, for checking out our blog. Did you try out weaving something? It’s pretty cool! How was your holiday in PP?